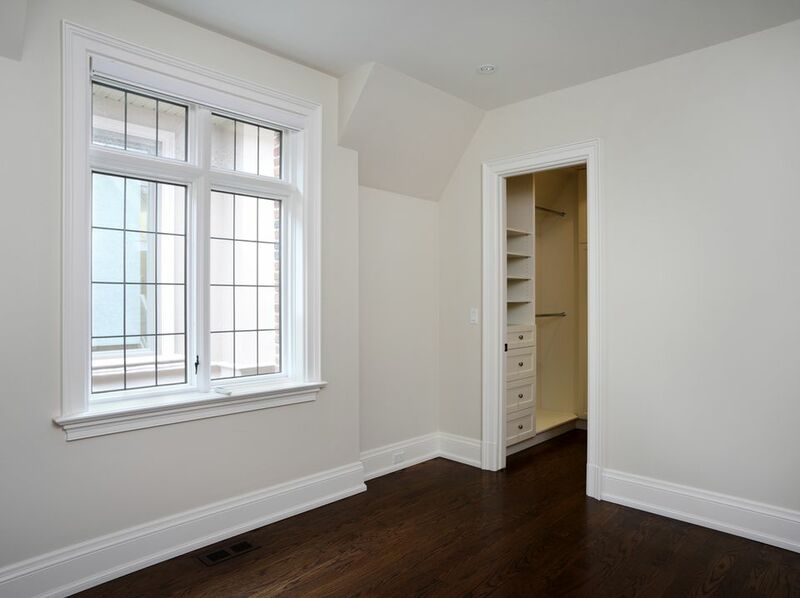 Whether it's room-size or minuscule, a closet typically is meant to serve a specific purpose and is one of two basic types: walk-in or reach-in. A walk-in closet is exactly that: It allows at least one person to actually "walk into" the space and turn around to walk out. A reach-in closet is one that you stand in front of and "reach into" to access clothes or other items. Beyond that, a closet may be fitted out with shelving, built-in cabinets, and drawers, multi-level hanging rods, specialized storage, countertops, work areas, or specialty lighting. While homeowners sometimes find new uses for existing closets, many people need more closet space. Fortunately, finding space for a new closet, and creating it, is easier than you might think. Closet walls are usually framed with 2x4 lumber; after sheetrock, the finished dimension is 4-1/2”. Single closet rods are usually located between 64 and 68 inches off the floor; double rods, at 38 and 76 inches above the finished floor. Adult clothes on a hanger require a minimum of 27 inches of clear space. Telescoping rods can comfortably store wider outfits. A rectangular walk-in closet with a door on the short end and hanging space on both sides requires at least 78 inches–or 6-1/2 feet–of clear interior space. Walk-in closet doors need be only 24 inches wide, but a 28- or 30-inch door is more comfortable, and you must allow for the swing. A pocket door, wall-mounted slider, slim bi-fold, or a pair of doors are good options. Reach-in closet doors–double bi-folds or bi-pass doors–are available in widths between four and six feet. Linen closets may have cabinet-style doors. The cost will depend on the size and the features, but homeowners typically spend between $1,000 and $2,500 for a new closet according to Home Advisor. Check with your local building department: Even if you don't need a permit, you'll need a licensed electrician if you plan to put a light in the closet. Draw the plan: Use grid paper—1/4” scale is common—with specific dimensions. It will serve as your materials guide as well as your blueprint. Plan specialized storage: Consider tall shelving, built-in cabinets, cubbies for shoes, a tilt-door hamper, a pull-down rod or seasonal clothing, or specialty racks for sports gear. Do a materials take-off: Ask for measuring assistance from your local big box store or lumberyard. In addition to 2x4s, you'll need some blocking material, sheetrock (or pre-finished paneling–aromatic cedar is nice), and flooring, as well as the necessary nails, screws, and finishing materials, including paint. Don't forget the door, door hardware, and required trim. Other tools will depend on the specifics of your planned materials. The interior of your closet can be as simple or as customized as your needs and budget dictate. Built-in shelving and simple cubbies don't have to be expensive, but closet systems and specialized options add appeal as well as function. At the very least, plan to install one or two shelves above a hanging rod; take advantage of vertical space. Lay out the wall(s) according to plan: Locate the position of each wall, and mark it out on the floor. At this point, cut away or remove existing flooring, especially if it's carpet or tile, in order to measure precisely; mark the position of the sole plate with chalk or tape. Frame the wall: The easiest method is to build the wall on the floor, then tilt it into its exact vertical position. In order to do that without damaging the existing ceiling, frame the wall 1/4 to 1/2 inch shorter than actual ceiling height. Use shims if necessary to secure the top plate to the ceiling. Secure the new wall(s) to the floor with liquid nail and/or screws, and screw the framing to existing walls and ceiling. Use shims as needed to assure that the wall is plumb and attached securely. Run electricity or add bracing: This is the time to add electrical wiring—your electrician will drill through the studs and place boxes for receptacles or switches. Built-in jewelry cabinets or ironing boards typically fit into the space between studs; but if you plan to hang cabinets or pull-down racks, this is the time to screw in some 2x6 bracing at proper hanging heights between the studs. Hang sheetrock or paneling: A helper will make hanging the sheetrock easier. Align 4x8 sheets so that seams fall in the middle of a stud. Use a power drill to screw the sheetrock or paneling to the studs. The next step is to "tape and bed" the seams, and sand the surface prior to painting. Install door(s) and hardware: Standard pre-hung doors are not difficult, but you'll want a helper. You'll need shims, a level, 3-1/2” wood screws and a power drill to properly align and secure the frames. Follow manufacturer's directions to install the top and bottom tracks and glides for bi-fold and bi-pass doors. A screwdriver and wood chisel should be sufficient for door hardware. Install rods and shelves: This is the final step, whether you're using manufactured closet systems, or simple rods, brackets, and shelving. Paint or finish as needed.